WASHINGTON, DC: Two global civil society organizations, Conservation International (CI) and the World Wildlife Fund-US (WWF-US) can now directly access funding from the Global Environment Facility (GEF) under a decision welcomed today by the GEF's governing Council. ScienceDaily — New research providing critical information about how climate change is affecting Australia's Pacific island neighbours and East Timor has just been released by the Australian Government's Pacific Climate Change Science Program (PCCSP). [Photo: Stuart Chape] The landmark, peer-reviewed publication, Climate Change in the Pacific: Scientific Assessment and New Research, presents the most comprehensive scientific analysis to date of climate change in the Pacific region. BRIDGETOWN: Advances made by Samoa on renewable energy measures were highlighted this week in Barbados at the High-Level Conference of the Small Island Developing States (SIDS). Titled: “Achieving Sustainable Energy for All,” the meeting brought together participants from SIDS energy and environment sectors, which included three delegates from Samoa. Speaking to the conference yesterday, Taito Faale Tumaali Faamoetauloa, Minister of Natural Resource and Environment (MNRE) emphasised on the progress made by Samoa in ensuring sustainable energy. Read More. Pacific Island Countries are among the most petroleum-dependent nations and territories in the world. However, Tokelau, a group of 3 small atolls in the South Pacific Ocean, will be the first to meet its electricity needs entirely through renewable energy by the end of 2012. Tokelau has a total land area of 10 square kilometres and a population of around 1400. Its small size, isolation and lack of natural resources are all restraints on its development. Worse, it has to spend approximately NZ$1million (approx. US$ 800,000) annually on imported fossil fuels. In 2001, the United Nations Development Programme (UNDP) started to work with the Taupulega’s – the village councils on each atoll - in the area of sustainable energy. With funding and technical assistance from UNDP, the first Tokelau National Energy Policy and Strategic Action Plan was endorsed by the government in 2004. Its primary objective was to make Tokelau energy independent through the use of renewable energy and energy efficiency measures. In partnership with France, New Zealand and UNESCO, UNDP supported various preparatory work including resource assessment, feasibility and design studies and the implementation of a solar system pilot demonstration. The organization contributed around US$450,000 and significant technical support during 11 years. Recently the Government of Tokelau succeeded in leveraging approximately NZ$8.5 million (US$ 6.8 million) in grants and soft loans from New Zealand for the project. The new solar plant is planned to become operational in September 2012.. Around 4,032 solar panels and batteries will be installed across all the three atolls of Tokelau, making the plant one of the largest standalone solar system in the world. The plant will provide 24-hour high quality electricity supply for all islanders, eliminating diesel use, and even produce surplus electricity to allow Tokelaunans to expand on their energy use. During periods of prolonged cloud cover generators that run on coconut oil will supply power and simultaneously recharge the battery bank. This hybrid solar-coconut oil system will enable Tokelau to be self-reliant for its electricity needs and be more energy secure, and set it on a carbon-free development path. It will also create employment opportunities and help the local population generate additional income. More importantly, the amount spent annually on the import of fossil fuel will be spared to support social benefits for the islanders. Tokelau’s ambitious goal could not be achieved without the sustained commitment of the government supported by its development partners, including UNDP. The government’s long-term determination has been pivotal in overcoming barriers along the way – such as the 25-30 hours boat journey from Samoa to Tokelau to transport materials and other resources. Tokelau will be the first Small Island Developing State to obtain 100% renewable energy by 2012, while Tuvalu and Cook Islands aim at 2020. The UN Conference for Sustainable Development (UNCSD or Rio+20) Subregional Preparatory Committee for Pacific Countries, convened in Apia, Samoa, on 22 July. During the morning session participants discussed global and Pacific regional preparations for Rio+20. Participants then considered green economy in the context of sustainable development and poverty eradication, focusing on greening the economy in a blue world. During the afternoon session participants examined institutional frameworks for implementing sustainable development in the Pacific region. Delegates heard presentations on national institutional frameworks for sustainable development, resources for transforming economies, including through climate financing, and on regional partnerships. Yaren, Nauru - I forgive you if you have never heard of Nauru — but you will not forgive yourselves if you ignore our story. At just 8 square miles, about a third of the size of Manhattan, and located in the southern Pacific Ocean, Nauru appears as merely a pinpoint on most maps — if it is not missing entirely in a vast expanse of blue. But make no mistake; we are a sovereign nation, with our own language, customs and history dating back 3,000 years. Nauru is worth a quick Internet search, I assure you, for not only will you discover a fascinating country that is often overlooked, you will find an indispensible cautionary tale about life in a place with hard ecological limits. Phosphate mining, first by foreign companies and later our own, cleared the lush tropical rainforest that once covered our island’s interior, scarring the land and leaving only a thin strip of coastline for us to live on. The legacy of exploitation left us with few economic alternatives and one of the highest unemployment rates in the world, and led previous governments to make unwise investments that ultimately squandered our country’s savings. I am not looking for sympathy, but rather warning you what can happen when a country runs out of options. The world is headed down a similar path with the relentless burning of coal and oil, which is altering the planet’s climate, melting ice caps, making oceans more acidic and edging us ever closer to a day when no one will be able to take clean water, fertile soil or abundant food for granted. Climate change also threatens the very existence of many countries in the Pacific, where the sea level is projected to rise three feet or more by the end of the century. Already, Nauru’s coast, the only habitable area, is steadily eroding, and communities in Papua New Guinea and the Solomon Islands have been forced to flee their homes to escape record tides. The low-lying nations of Tuvalu, Kiribati and the Marshall Islands may vanish entirely within our grandchildren’s lifetimes. Similar climate stories are playing out on nearly every continent, where a steady onslaught of droughts, floods and heat waves, which are expected to become even more frequent and intense with climate change, have displaced millions of people and led to widespread food shortages. The changes have already heightened competition over scarce resources, and could foreshadow life in a world where conflicts are increasingly driven by environmental catastrophes. Yet the international community has not begun to prepare for the strain they will put on humanitarian organizations or their implications for political stability around the world. In 2009, an initiative by the Pacific Small Island Developing States, of which I am chairman, prompted the United Nations General Assembly to recognize the link between climate change and security. But two years later, no concrete action has been taken. So I was pleased to learn that the United Nations Security Council will take up the issue tomorrow in an open debate, in which I will have the opportunity to address the body and reiterate my organization’s proposals. First, the Security Council should join the General Assembly in recognizing climate change as a threat to international peace and security. It is a threat as great as nuclear proliferation or global terrorism. Second, a special representative on climate and security should be appointed. Third, we must assess whether the United Nations system is itself capable of responding to a crisis of this magnitude. The stakes are too high to implement these measures only after a disaster is already upon us. Negotiations to reduce emissions should remain the primary forum for reaching an international agreement. We are not asking for blue helmets to intervene; we are simply asking the international community to plan for the biggest environmental and humanitarian challenge of our time. Nauru has begun an intensive program to restore the damage done by mining, and my administration has put environmental sustainability at the center of our policymaking. Making our island whole again will be a long and difficult process, but it is our home and we cannot leave it for another one. It's interesting how traditional knowledge is sidelined when discussing national policy on the environment, one thinks that this would be a good place to start from in order to ensure that the skills and knowledge of grassroots level communities on environmental issues are used as a basis of our peoples understanding of such issues. 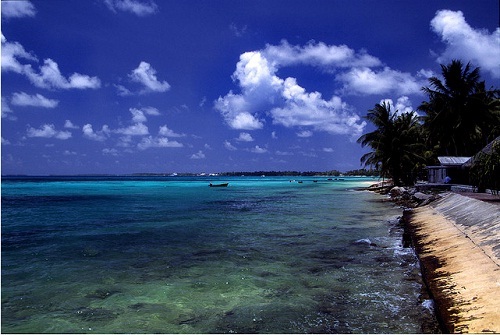 Kiribati urges for say Cancun climate outcomes. Island Hoping: Are Reserves the Answer to Help Wildlife on the World's Sinking Archipelagos?